If we took Rachel Griffin’s Enlightenment as the answer, it would be “Largely the same; other shenanigans would arise to fill the gap.” There are, in fact, so many shenanigans springing up that the whole 360 pages or so comprise five days, assuming I counted properly. – Rachel, a wizard girl of Noble Blood, with an eidetic memory, a strong work ethic, an unyielding compulsion to obey adults (until she tries really really hard and breaks said compulsion), a devotion to her father which must eventually be transferred elsewhere, and complete religious ignorance…but I’m getting ahead of things. By dint of memory and effort, she flies very well. She remembers everything she looks at, though there were too many instances of Let Me Stop And Review The Picture In My Head for my taste (though I must concede their purpose: to help her see past magical obfuscation). She is super concerned with Who Likes Whom. – Siegfried, an orphaned dragon slayer who often exclaims “Ace!” while hoarding his gold and food (so much so that he doesn’t know to buy an extra set of clothes), and whose quixotic ideas move the narrative forward, if haltingly. – Nastasia, a Russian princess…of Magical Australia, for whatever reason. She has a Bag of Holding, a violin, several skills which I have forgotten, a deeper commitment to the rules than even Rachel has, and the blessing/curse of having Visions when she touches certain people. Many other figures crop up, though their development is flimsy. Honestly, a lot of it reads as flimsy: the number of talents every single character has, the fact that a “girl reporter” is under threat of death, the amount of improbable things figured out by a bunch of 13-year-olds, the rapid escalation of threats interspersed with a lot of concern over dating. The names – Gaius Valiant, Salome Iscariot, Dr. Mordeau, to name a few – are either super-literal or the reddest of herrings; I’m betting on the former. Still, a few subtler details await development by the margins. For one, individual takes on magic and magical worlds are generally diverting, and this world is no exception. The American wizarding school, the Roanoke Academy for the Sorcerous Arts, explains how the colony of Roanoke went missing: the school’s founder turned it into a floating island, safe from the eyes of the Unwary (this world’s Muggles). Magical familiar animals, music, and particular materials (including wands of metal and jewels) contribute to one’s magical abilities. One of the most intriguing facts is that Rachel Griffin, Devourer of Library Books, is ignorant of all religious information – to the point where she doesn’t understand why a broom would be branded a “steeplechaser,” or what a friar is, or what the winged statue in the forest might be. The dramatic irony involved might carry on through another book; given the visions, Morningstar references, and discussions between a prophetic raven and a miniature lion, I expect some kind of celestial showdown in the end. Hopefully it doesn’t get too preachy. Altogether, it’s a story that’s mostly drawn in Crayola colors – but here and there are shades in between, shadows implying that something deeper may come. The concept is better than the execution; by the end of the narrative, I wasn’t certain what Rachel’s “unexpected enlightenment” actually consisted of. Hopefully the next three installments can answer the questions this book left hanging, and further illuminate the reality (and history) of the Wise. You’ve heard, I’m sure, of the sad fact that Alan Rickman died of cancer last week. 69 years on earth, and suddenly he is gone. Whether you loved him best as Hans Gruber, Severus Snape, the Sheriff of Nottingham, Professor Lazarus, Metatron, Marvin the paranoid android, Judge Turpin, Colonel Brandon, or someone else entirely – solely himself, perhaps – I’m sure you, like me, will miss him. So here’s a tribute. Raise a glass (or several!) with me. Nancy has a delightful explanation for her Snape concoction (which was the original reason I sought out Fernet Branca and falernum, to be honest). Having no lavender bitters, I attempted to make up the difference with some other floral additions. As she says: strong, dark, complex. Stir with ice and strain into an appropriate goblet. This is my nod to the Potions Master and the head of Slytherin House: herbal, complicated, very green, full of venerable spirits. It’s a lot like a Last Word (equal parts gin, Chartreuse, lime, and Maraschino), but sourer. I wondered if perhaps there were a simpler approach to Snape. This is one such attempt, applicable to Sorcerer’s Stone Snape: a straight shot of Cynar, which is a drinkable bitter made from artichokes (ie, instead of an intensity which requires but a few drops in a cocktail, it’s dilute enough to consume on its own). It’s complex, vegetal, dark, and (of course) bitter. An acquired taste, but when you love it, you really love it. Harry Potter, of course, finds Cynar innately suspicious. He would; he’s only 11, after all. The thinking here was that Dane is Very Serious Business – “I played Richard III!” – not-quite-obscured by something brightly colored and mildly ridiculous. Overall: shiny and enjoyable. I had the idea to make something rather British and proper, but also sweet enough to appeal to those moved chiefly by their sensibility. It turned out to be a bit cloying, so throw in some sturdy Calvados or genever to bolster it: something befitting a man of action, one who needs an occupation lest he run mad. It’s sweet enough not to be totally off-putting, but it is very very strong. The smoky smell spread throughout my dining area and kitchen. Ideally this would have been mixed with coffee or espresso, to represent Alan’s liveliness and how engaging he was. But it was quite late by that point, and prudence won out. I hope to have a bit of a film festival before long, and see how a caffeinated version of this fits into it. Alan, here’s to you. We mourn your passing, but are glad you were there to depict Very Interesting People for a time. You delighted us, and we will miss you. Always. Having peered through my bookshelves mentally, I concluded that most of the books I’ve read and reread have been discussed here, some more than once. The eponymous character is, in brief, a 12-year-old criminal genius with lots of family fortune to throw around. Having both the faith of a child and the focus (and the aforementioned helpful resources) of an adult, he sets out to find a fairy and relieve it of its gold. So that makes for a fun romp of a book even before one learns that the fairy People (of various species, including elves, trolls, dwarves, and goblins) live underground and are far more technologically advanced than one might expect. Holly Short, an elf who is part of the Lower Elements Police (Recon division – LEPrecon for short) winds up being kidnapped by Artemis and his Butler halfway through completing the ritual to renew her magical energy. Beyond the thrilling showdowns, there’s threads of mystery (including a Very Important translation project – how great my joy! 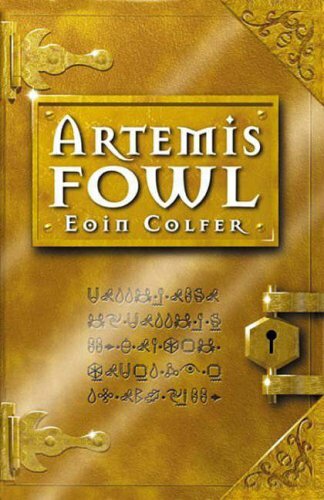 ); Artemis seeking help for his mad mother and searching for his missing father; Holly’s devotion to her duty; Eoin Colfer’s environmentalist concerns; plots within plots and (to my delight) a fae delight in loopholes; and a fun mix of magic and tech. There’s a fair bit of deus ex machina, especially where dwarf Mulch Diggums is concerned, but overall it’s a swift and entertaining story. Today, I’ve been pondering the Pensieve. 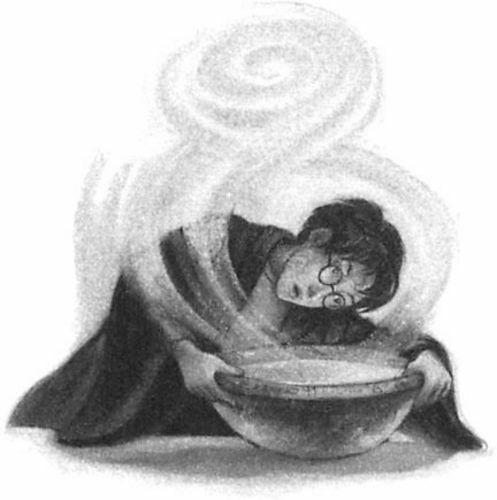 One of J.K. Rowling’s inventions in the Potterverse, it is a bowl with various runes carved into it; magic allows one to draw silvery threads of thought out of one’s head and put them into this basin. The purpose is twofold. The first is that when one’s head is too full of thoughts, some of them can be unloaded. Imagine how useful: remove the thought when you need to stop replaying your worst memory in your head; when you need to focus on one task instead of a dozen others; when you can’t sleep for anxiety; when you have so many ideas to ponder that you cannot pick and follow a single train of thought to its terminus. Typically, though, we only see it used (in the books, at least) to examine memories – an extremely plot-convenient film reel or record of events, made shareable through the magic of the Pensieve, and more exact than life. Useful though it sounds, I don’t typically long for a Pensieve. The act of picking out which thoughts to remove, to line up, to examine – that is organization enough for my Muggle purposes. I also imagine that removing the first two or three thoughts could render one unable to recall which other thoughts one had wanted to cull and examine. On the other hand, there are thoughts I wish I could erase or delete or scrub away with brain bleach. The objects we perceive are grist for the mill of our cogitation, memory, and imagination; and only that which has been milled by the internal senses can contribute to our intellect and understanding. Thus the things I see, the stories or articles I read, the words or music I hear, all become a part of me. I should take far greater care for what grist enters the mill of my mind. And so it bears mentioning that while I hunted for a picture of this thoughtbowl – look how decorative! – other basins came to mind, specifically baptismal fonts. 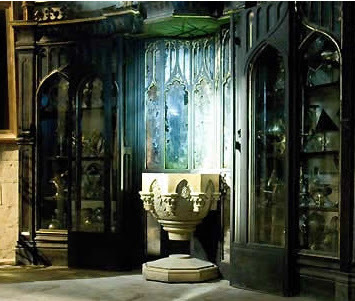 I don’t believe Rowling meant to allude to the sacrament of baptism with her cogitation-basin, but I reckon that the baptismal font is the best help available for management of our thoughts and our inner life. These two parts, to be sunk under the water and drawn out again, signify the power and operation of Baptism, which is nothing else than putting to death the old Adam, and after that the resurrection of the new man, both of which must take place in us all our lives, so that a truly Christian life is nothing else than a daily baptism, once begun and ever to be continued. For this must be practised without ceasing, that we ever keep purging away whatever is of the old Adam, and that that which belongs to the new man come forth. But what is the old man? It is that which is born in us from Adam, angry, hateful, envious, unchaste, stingy, lazy, haughty, yea, unbelieving, infected with all vices, and having by nature nothing good in it. Now, when we are come into the kingdom of Christ, these things must daily decrease, that the longer we live we become more gentle, more patient, more meek, and ever withdraw more and more from unbelief, avarice, hatred, envy, haughtiness. What a litany. Angry, hateful, envious, unchaste, stingy, lazy, haughty, unbelieving, infected with all vices. True, true, true, true, and true. I need much more than the removal of this or that unhealthy story, rude joke, vacuous song, or meaningless article. I need nothing less than the washing of regeneration for all my thoughts, each and every day. Baptism is not a one-time event. It is the power of God to drown that Old Adam daily. The thoughts put in to the baptismal font will either be redeemed, or they will be eradicated. My housemates and I went to see Captain America: The Winter Soldier yesternight. Having set some kind of precedent by reviewing Frozen two months after it came out, I’ve decided not to feel too weird about reviewing The Winter Soldier a month and three days in. Spoilers ahead. BE YE WARY. Considering that it’s called The Winter Soldier, I felt that the Winter Soldier himself was not tremendously important. A good deal more time was spent on the question of whom to trust, how different it looks for someone like Steve Rogers to fight for the side of good nowadays, and what to do when everyone you know is trying to kill you. Admittedly, it’s not like they could call it “Captain America: Second Head of Hydra” or something, since that would iron out a fair few plot twists. Whilst watching the STRIKE team’s mission to rescue hostages from pirates aboard the Lemurian Star, I was struck by the swiftness of it all. It isn’t shocking for me to think of SHIELD taking decisive action against threats, but the thought of Steve Rogers killing a couple dozen men as “janitor for Fury” gives me pause. Is this cognitive dissonance mostly borne out of semantics? Possibly. It was something of a relief to be distracted by the choreography of the fight scene between Rogers and Georges Betroc, which evidently involves savate or French kickboxing; it was so graceful. That was a welcome reprieve before everything went to heck and all the shots were fired. I was touched by the post-surgery bit. Don’t do this to me, don’t do this to me. And then they went and did it anyway. I guess I have not yet watched enough Marvel movies, because I believed them. But no – that’s not how comic book stories work. No one actually dies and stays dead, except for redshirts on both sides. This means you have to take a good bit of care when dispatching your enemies, because they might creep off and then infiltrate your ranks and take over everything. “Taking over everything,” in this case, is partly about firepower, but mostly about information. Hydra’s algorithm, which sifts data about individuals in order to predict which will eventually prove an obstacle to Hydra’s goals reminded me, unsurprisingly, of Minority Report. Though the firepower of Project Insight’s helicarriers was removed, presumably the information still remains out there somewhere. Eeeep. Also out there somewhere: Bucky Barnes on a voyage of self-discovery and metal arm maintenance; thousands of tons of destroyed helicarrier (on one hand, a profound relief; on the other, such a lamentable waste of taxpayer money); and everyone’s favorite, alien technology in the hands of power-hungry scientists. Age of Ultron‘s gonna be chock-full! – Who gets the royalties for putting the SHIELD eagle on everything, including their jump drives? – How safe is it to drive with an eye patch? How safe is it when there aren’t a couple dozen people trying to shoot you? – Wait, how did they acquire the Falcon wingpack, or Pierce’s phone to call Sitwell, or a magical Council disguise? Any one of those could have been its own subplot. – Likewise: what exactly has Hydra done to Bucky? How many other people could they control in like manner? Maybe instead of killing all their threats, they should reprogram them. Maybe they already are. 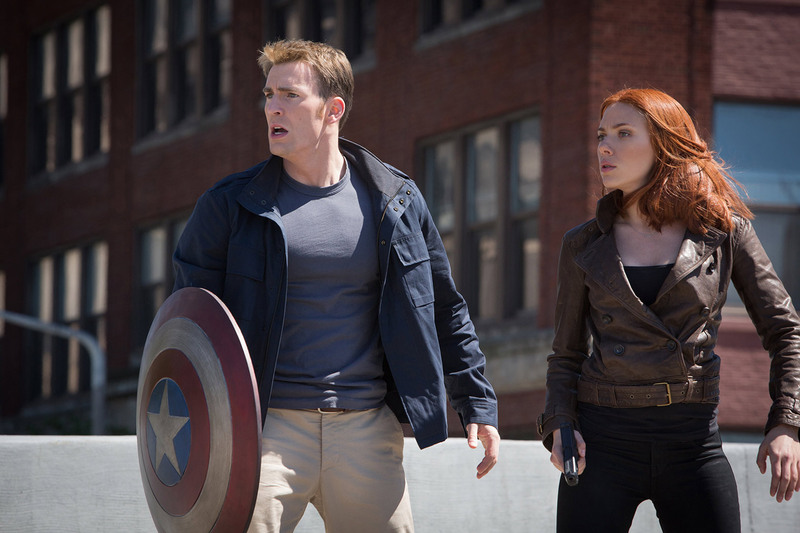 – What do the three replacement chips for the helicarriers do, exactly? Like, gosh-darned convenient for lovers of freedom and haters of Hydra, but why do they even HAVE that lever? Overall, I’d say The Winter Soldier was a fun and interesting addition to the Marvelverse, and a good setup for films to come. Have you seen Marvel’s latest? What did you think? We crown thee with hope, love and faith. Of course, it’s hard to sing a choral piece (or antiphonal yoiking) alone, so I’ve also had “Let it Go” and “Love is an Open Door” running through my head on repeat. It’s lovely having a song of defiance against the Polar Vortex weather. – Hullo, unexpected poignancy. 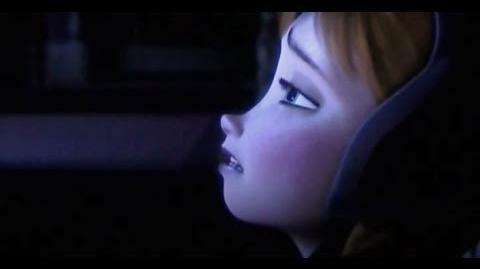 “Do You Want to Build a Snowman?” sounds so lighthearted, and then it struck me with feelings. Even worse is the thought that Elsa and Anna didn’t need to spend so long isolated from each other; Anna trusted her sister all along, and the utter lack of communication didn’t protect either of them. Pardon me while I go do some gross sobbing in the corner. – Nothing separates a guy from his reindeer. Kristoff and Sven are precious, like a friendlier version of Flynn and Maximus from Tangled. There were lots of moments that made me giggle, and those two probably accounted for most of them. – Someone finally said it. – Additional background would be groovy. We don’t really need to know where Elsa’s power comes from, for the sake of the story, but I would love to know more about her as well as the erstwhile king and queen. Is Elsa like a Muggle-born cryokinetic witch, or is Anna like a Squib who missed out on the elemental control? Also, if I were a nerdier person, I would love to calculate how much energy is getting thrown around when, say, the entire fjord is frozen. See a bit more commentary on that here. – Darlin’, I don’t know why you go to extremes. My brother and I wondered if, perhaps, the well-intentioned Love Experts actually gave the worst advice: concealing the source of the problem and counseling Elsa to beware of fear in no way encouraged her toward the positive virtue of being more loving. “Conceal, don’t feel” was never a viable option, and when Elsa does finally let it go, she swings to the other extreme so hard that editorials on the dangers of repression write themselves. Thankfully things reach a sort of equilibrium; it’s fortunate (and kind of weird) that she is able to undo her enchanted winter quicker than Aslan brings spring to Narnia. – True love sacrifices. Love is not summed up in kisses, but consists of all manner of heart-thawing actions. Love forgives the pains one has suffered. Love runs to the aid of the beloved, love throws itself between the beloved and the sword, and love binds people together whether they’re parents and children, siblings, romantic couples, or friends. it, a stream of winding discourse on more diverse topics than our ostensible subject, Lewis’s Cosmic Trilogy. 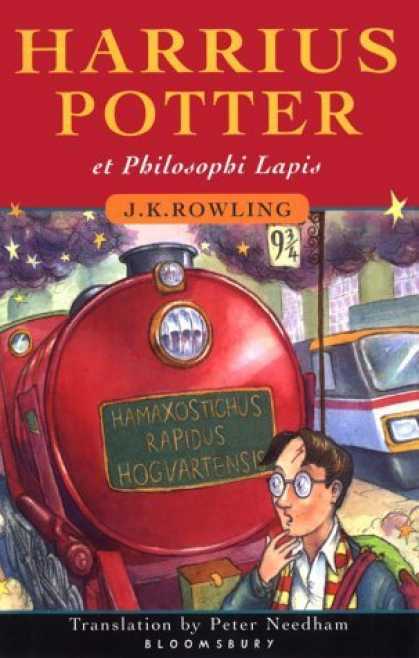 A tangent on book-thievery and book-reclaiming prompted me to bring up Harrius Potter et Philosophi Lapis, which is Harry Potter and the Philosopher’s Stone in Latin. Which prompted a bit more laughter than I expected, and more thought on the Patronus Charm than is typical. Not everyone reading is a Potterite, so here’s a brief description: a Patronus is a sort of offensive shield, a silvery animal-shaped guardian which is the corporeal form of a happy memory or thought. It launches itself at both Dementors and Lethifolds, holding them at bay if not driving them off. – In the maze Harry goes through to reach the Goblet of Fire, he meets a Dementor-shaped Boggart. Driving it away isn’t quite the same as driving away a real Dementor, but the mechanism is the same: he concentrates on getting out of the maze and celebrating with Ron and Hermione, something that hasn’t happened, but which he hopes for. – During battle in Deathly Hallows, Harry attempts to conjure a Patronus but cannot summon up any happy thought whatsoever. Luna prompts him with “We’re all still here; we’re still fighting.” It costs him more effort to conjure than it ever has before, as the situation is so grim, but Harry’s Patronus still bursts forth to stand guard. – Harry uses one to drive away a lot of Dementors near the end of Prisoner of Azkaban. In his words, “I knew I could do it this time, because I’d already done it – does that make sense?” In this event, he focuses not on a happy memory, nor a positive thought, but on his certainty that the Patronus will save him because it already has in his other-time’s experience. Dementors as Rowling wrote them aren’t a foe we ever meet with; that said, it is Monday again, and we have our own battles to fight, be they e’er so humble. Where a happy memory may not get us through, our hopes may; perseverance may; or faith may, the assurance about what we do not see. There are occasions, even in the Muggle world, when our happiness is drained away, when we feel as though we will never be happy again. What happy memory or hope is your guardian against Dementor-like feelings? 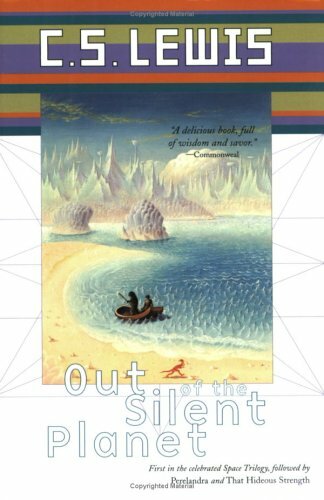 Note: This review was written as part of the Pages Unbound C. S. Lewis Read-Along for the month of February 2013. Go check out their master list for more Lewisian topics! Perhaps it is a peculiar practice to review a book one has read at least two or three times already. But perhaps it is the only honest way to do it. I’ve let Out of the Silent Planet, first book of Lewis’s Cosmic Trilogy, rest on my shelf for a few years already; though I recalled where the story ended up, I didn’t always recall how it got there. “Narrative lust,” that is, wanting to know How It Ends, wasn’t necessary to carry me through; the story retains an element of freshness and would not, I think, be worn thin by further rereadings. A nightmare, long engendered in the modern mind by the mythology that follows in the wake of science, was falling off him. He had read of “Space’: at the back of his thinking for years had lurked the dismal fancy of the black, cold vacuity, the utter deadness, which was supposed to separate the worlds. He had not known how much it affected him till now – now that the very name “Space” seemed a blasphemous libel for this empyrean ocean of radiance in which they swam. He could not call it “dead’; he felt life pouring into him from it every moment. …No: space was the wrong name. Hence my references to the Cosmic Trilogy, rather than the Space Trilogy. Cosmic better captures the nature of this book, which is a bit of a pastiche genre-wise: it has something of the mythic (particularly where the hrossa and their poetic inclinations are concerned), a good dollop of the supernatural, bound up in a science-fiction narrative which was composed early enough to be called scientifiction. Even without that slightly archaic term, there are points when it becomes clear that this book is an early effort (though far from the earliest) in the science-fiction genre. The nature of the spaceship, Ransom’s somewhat foggy understanding of the ship itself, gravity, the occasional confusion where other celestial bodies are concerned, his attempts to figure out how this new planet Malacandra sustains life: these are details absent, or strikingly different and more true-to-life, in books written fewer than 75 years ago. Some readers get distracted by this, but I suppose it’s never troubled me, since it’s clearly a facet of Lewis’s world-building. 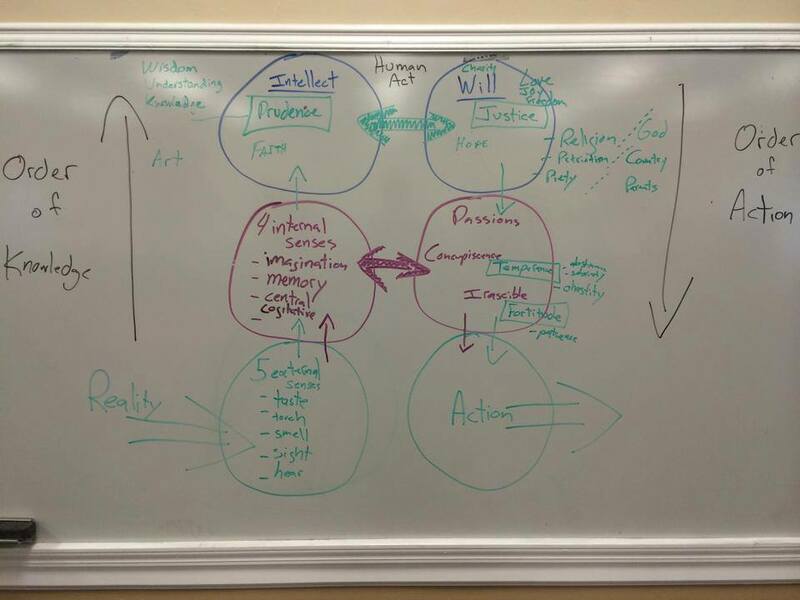 The three main facets of said world-building, so far as I noted them, are as follows: the physical descriptions as Ransom sees and interacts with the country around him; the details and history learned from the hrossa, sorns, and Oyarsa; and over-around-through it all, the use and limits of language. This last seems especially noteworthy. Lewis paints the world and its inhabitants in bold, bright colors: clouds of red stone, neon blue rivers hiding a lightning-fast eel, pink scrub, sweeping green mountains, and precarious-looking purple vegetation. By analogy he gives us to understand more or less what a hross looks like (something like a penguin, otter, and seal, with the flexibility and litheness of a stoat), and a sorn, and even a pfiffltrigg. There are occasions where discussions of life and philosophy are worked in, despite Ransom’s shaky grip on the Malacandrian tongue. But there are also times when words fall short, both when the narrator tries to put an experience into words which cannot be so rendered, and when Ransom attempts to translate Earthly arguments into Malacandrian. This language doesn’t have so many shades of meaning as English, and therefore cannot be used in the subtly misleading fashion that is the travelers’ wont. It reminded me of nothing so much as Diggory and his Uncle Andrew: Devine and Weston, the other Earthlings, are so quick to couch their goal in the rosiest terms and obscure whom shall be sacrificed on the altar of progress, making it really seem, for a second, that ‘they were saying something rather fine” (indeed, they think they are). In the end their greed, their halting understanding, and their having set up an unimportant rule as their guiding principle, reveals these two to be ridiculously silly figures. It is quite as entertaining as Uncle Andrew being planted and watered. I have some minor quibbles with the story near the end – there’s a spot of trouble the Earthlings manage to avoid though it’s never explained how – but overall, this first book of the Cosmic Trilogy is a fine step in a somewhat different direction for those who loved Narnia. Further delights await elsewhere in the Field of Arbol!